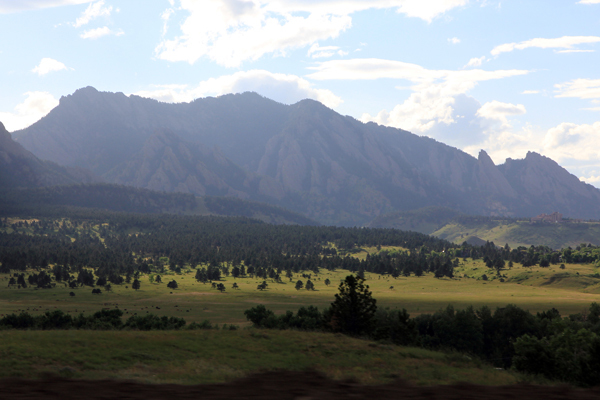 The Flat Irons near Boulder, Colorado, not far from Denver. We have lived in and visited both coasts of the US and have a pretty good understanding of both sides. But we never quite understood Middle America, aside from what the media shows us. So, we decided to go visit Denver, Colorado. (No, not because of marijuana legalization there.) It’s not too far of a trip to take from the Bay Area, and I heard it’s not a bad city to bike in. Denver is referred to as “the mile-high city” or 5280 which is the number of feet it sits above sea level, and it’s located next to the Rocky mountains, which are the highest mountains in the United States. This time, we planned to travel light which meant that Nellie brought only a single backpack and I brought only my messenger bag. We left our Bromptons at home because we thought the bike-share program that they have in Denver would suffice and be more convenient. The closest bike-share station would be only a block away from our hotel, so why not. As a bonus, our hotel was located next to the only cycle track in the city, on 15th St. 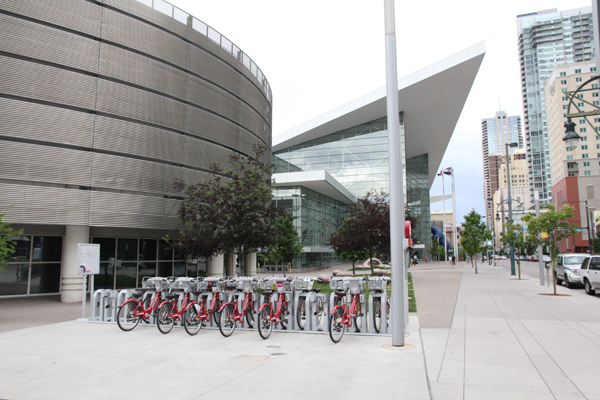 This bike share station is located on the sidewalk near our hotel on 14th St. and Welton St.
As a matter of fact, the bike-share stations are nicely distributed across downtown Denver. There are 700 bike-shares in 83 stations, twice as many as in San Francisco. 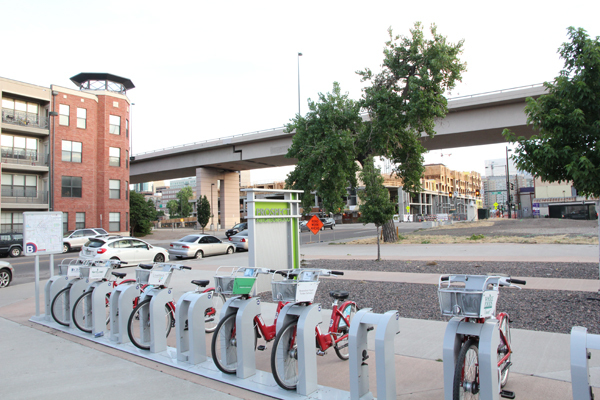 It’s called Denver B Cycle, and sourced from the same company as most other bike shares in the US, Alta Bikeshare. Although their mobile app didn’t work, we could locate another station without even looking for one. It’s that ubiquitous. There was this brand-new redeveloped neighborhood called Prospect which was not completely done, and a bike share station was already in place. I was impressed. A bike share station is placed in the Prospect neighborhood, which is not even fully built out. The bike shares are always located on the sidewalks and not in the street, which I think is an ideal setup. The sidewalks there are generally very wide, up to 20 ft/6 m wide. By locating the stations on the sidewalks, you don’t feel the pressure to hurry because you are in a safe zone. Also, it’s nice to undock or dock your bike off the street, unlike how it is in SF. Bike shares invite newbies, so having them on the sidewalks makes them more welcoming. However, I still don’t like using bike shares when I would like to mindlessly wander throughout the city exploring. The 30-minute grace period was always on my mind because I didn’t want to accrue penalties. Also, docking/undocking is a huge hassle when you have to do it every 30 minutes. My opinion is that bike-shares are good if you know where you are going and only need it for going short distances. It would not be good for recreational our touristic cycling and for going long distances. The only cycle track in the city on 15th St.
Our hotel was located next to the only cycle track in town on 15th St. It was nicely done with crossbikes and protected barriers, but the intersection was not protected. Also, what I don’t get is why the cycle track was on the left-hand side. I heard that another cycle track is coming to a nearby street on Broadway, a north-to-south commercial corridor which should make a better network of bike paths. A crossbike with a right turn bike box. Another commercial corridor in downtown that is bike-friendly is the popular shopping area, the 16th Street Mall, which is closed off to cars. There are hundreds of shops and street vendors located on this long stretch. The identical tiles on both the street and sidewalks give it a very pedestrian-friendly feel to it. No need for bike signage. 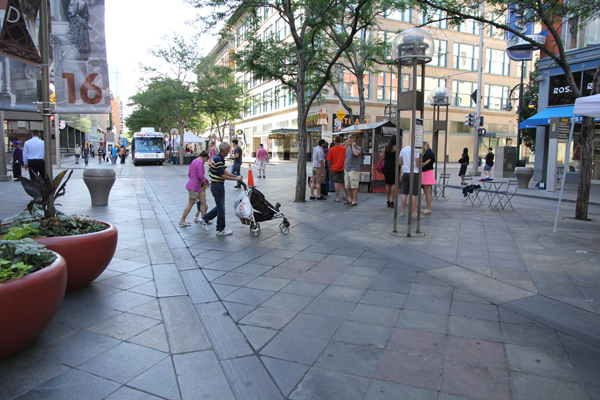 The 16th Street Mall is closed off to cars except buses and bicycles. Denver has a bike modal share of 2.9% in 2012 (20% jump from 2011), most of which I see riding on the extensive Cherry Creek bike trail. The Cherry Creek trail stretches 11.2 mi/ 18 km from Cherry Creek Reservoir in the south and through downtown in the north. It serves for both recreation and transportation. It’s a must if you do visit Denver and go for a bike ride. Some of the best scenery within the city is along this riverside bike trail. The water running next to it is surprisingly clean! 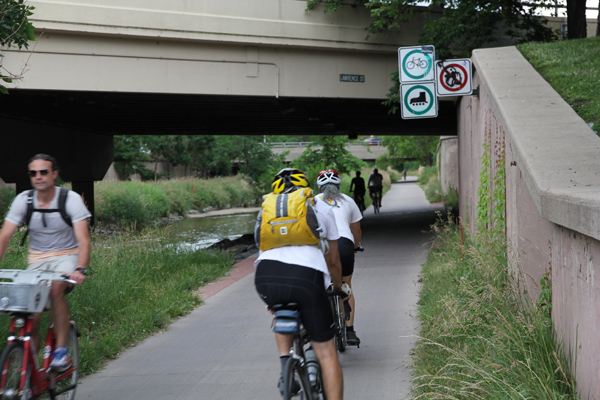 You see both recreational and utilitarian cyclists on the Cherry Creek bike trail. I like how there are street signs installed on the bridges, so you know where you are going. People actually go rafting and kayaking on the creek and the water is pretty clean! 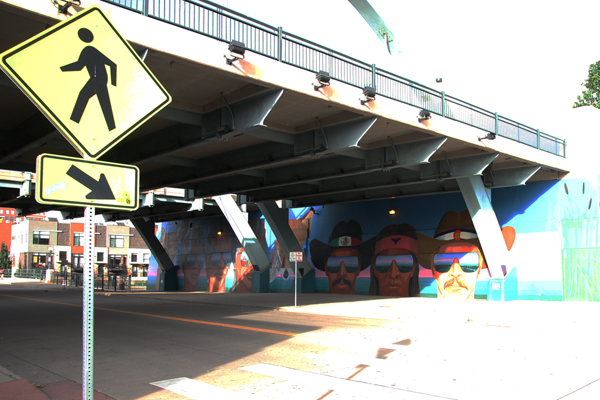 The “Confluent People” mural by local artist, Emanuel Martinez is located at Speer Blvd. and Little Raven St.
What I like about Denver is it’s numerous parks, and the majority of them you can really bike within them for quite a distance with flat topography. City Park is my favorite and has a zoo and the Museum of Science and Nature. It’s located not too distant from downtown. Another park I recommend is Washington Park in the Pearl St. neighborhood. 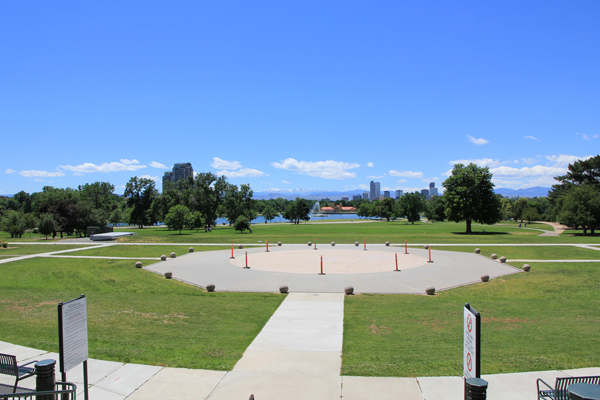 It’s voted as the most favorite park in Denver by the locals. 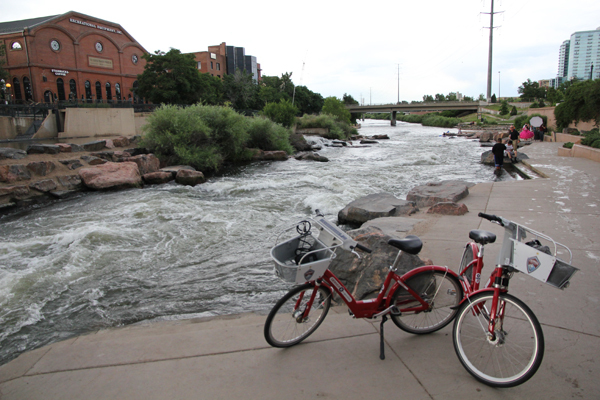 City Park, not too far from downtown Denver, is a great place to bike recreationally. 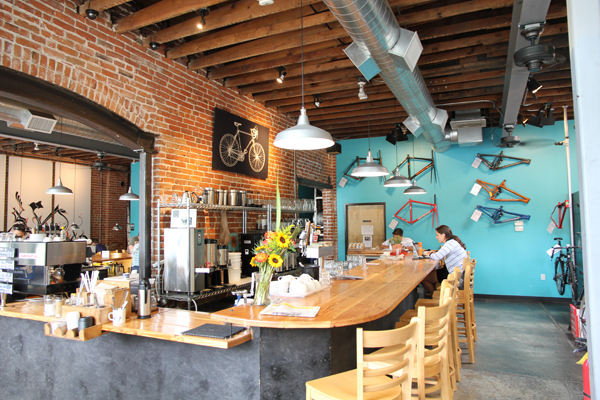 Our favorite cafe is the Denver Bicycle Cafe. You can get food, beer or coffee while you wait for your bike to be fixed. 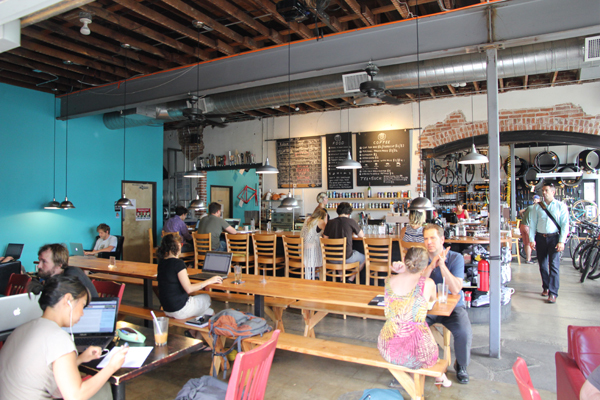 Denver Bicycle Cafe also has comfortable outdoor seating (not shown here). 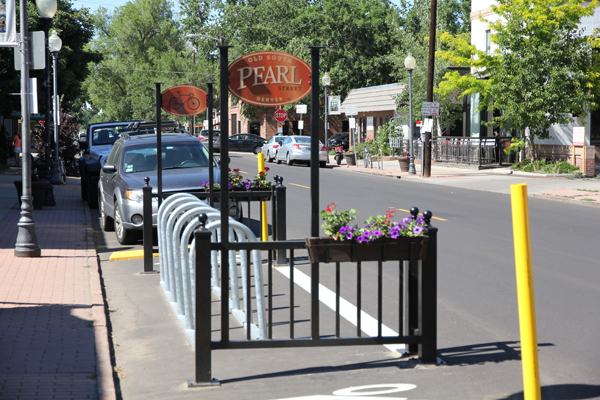 A nice looking bike corral in the charming Pearl St. neighborhood. 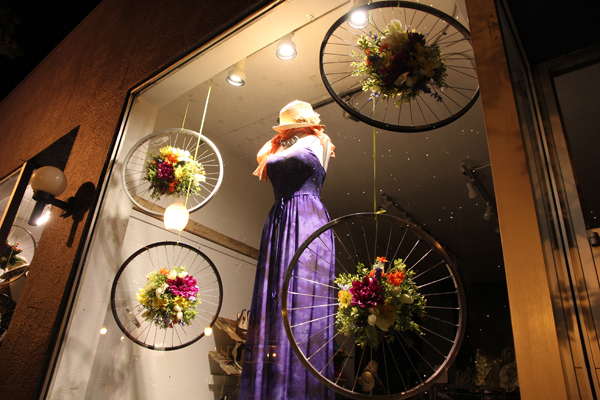 Cute little Linus bikes in the Green Cyclery bike shop on Pearl St.
Creative window dressing using bike wheels! 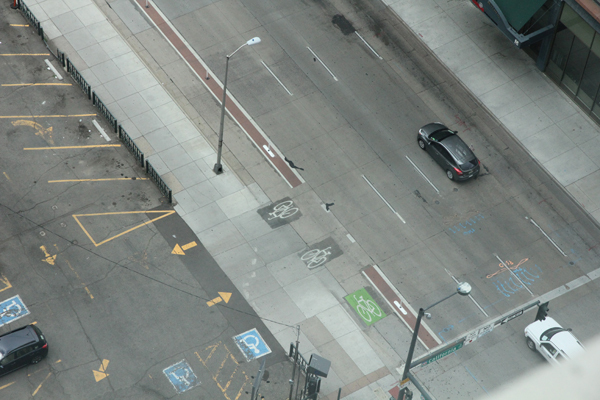 I still think Denver has some ways to go in terms of bike infrastructure and reducing their use of cars. But I admire how much they are embracing the ideas of New Urbanism and I feel like they are doing the bike thing better and faster than many other American cities. For example, their 15th St. cycle-track was completed this year and now, the city is proposing another cycle-track on Broadway St. In addition, I really like their ubiquitous bike-shares, but it’s just not ideal for visitors to use them to explore the city because of the time limits. 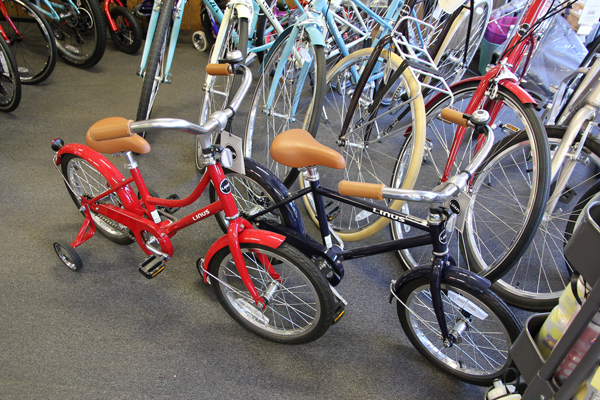 Visitors and recreational riders should rent a bicycle instead. Their Cherry Creek bike path is great fun to bike on and quite scenic, but then, it doesn’t go in every direction to really serve bike commuters. However, I do think that overall, the city government gets it and it’s just a matter of time. 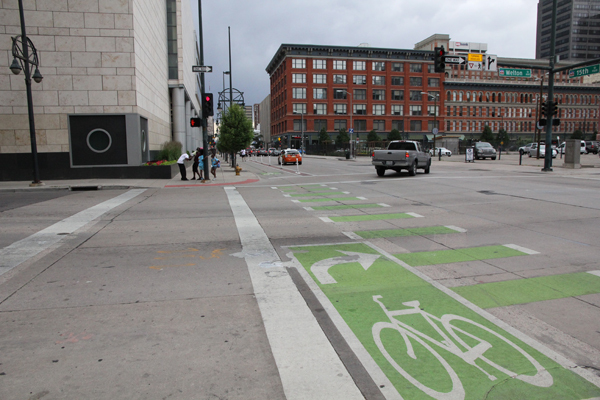 A couple of more things I want to mention for anyone who is going to visit Denver and bike around. You may need some time to adapt to the higher elevation. At higher elevations, oxygen is less concentrated and so your body will have to adjust and breath shorter but more frequent breaths. At first, you might feel worn out faster when exerting yourself. However, the air is just fine for Denverites who are known to be very active outdoors. So once you adjust, you should be fine. Also, one of the fun things you can do in Denver, if you are of drinking age, is to ride your bike around to all the different local breweries and do some free tastings. Denver has great local beer! Many can be easily reached by bike. Written by Chris 3 Comments Posted in Bicycle Infrastructure, Bicycle Travel, Denver - Colorado	Tagged with B-cycle, bike share, Cherry Creek bike trail, Denver, Denver Bicycle Cafe, Pearl St.